Grindthieves is back and they want you to know about IBN017! If you don’t already have IBNo17: Battle At Silent Barn in your life, go get it (Download IBN017: Digit216 vs. 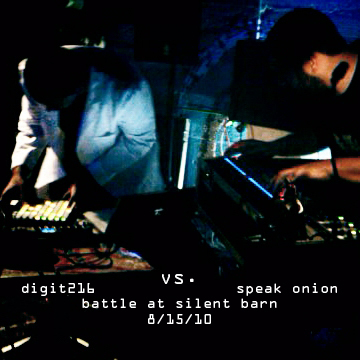 Speak Onion- Battle At Silent Barn). And whatever you do, keep looking at Grindthieves for releases, mixes, shows, and all manner of great stuff. I.B.N. 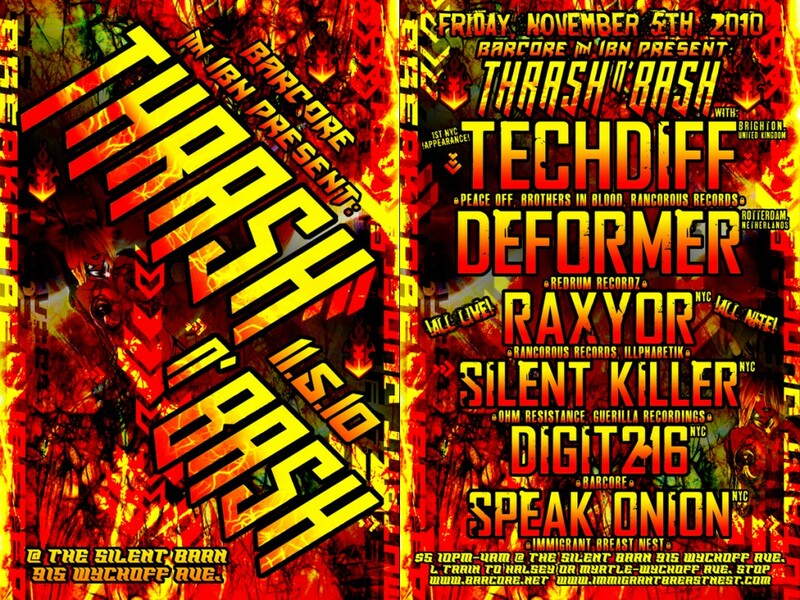 Teams Up with Barcore to Bring You Breakcore Madness, Friday 11/5 at Silent Barn! Yep, we’re bringing you the face-melting electronic fury. 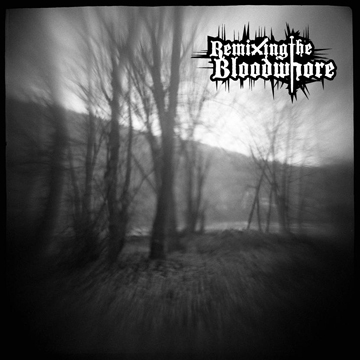 Breakcore, dubstep, mutant jungle, or anything else that can pop out of a sampler and scare your grandma. Your boy, Speak Onion, starts it off at 10 PM, and everything gets more and more ruined from there. We’re stoked to have Techdiff and Deformer in from overseas, so let’s show them how NYC bangs out. I.B.N. Presents party at Silent Barn on Sunday 8/15! Note: The venue is now changed to SILENT BARN at 915 Wyckoff. Sorry for the late notice! 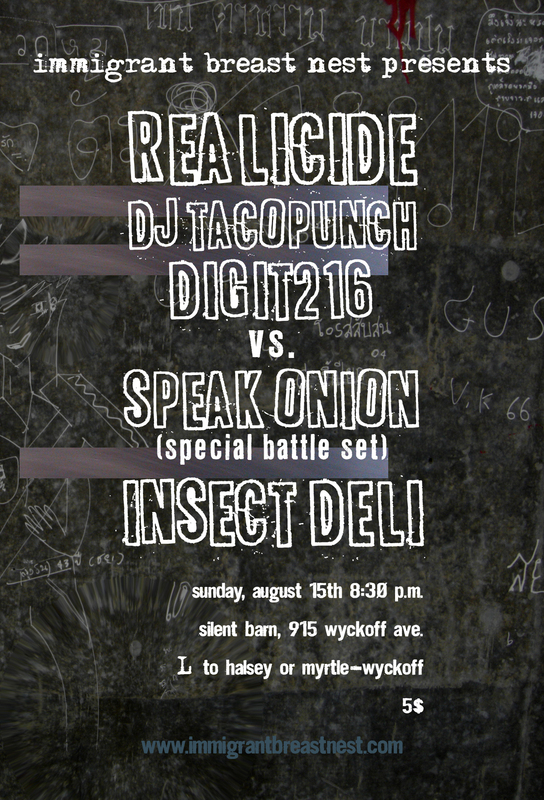 Realicide and DJ Tacopunch are bringing the crazed electronic hardness from out of town, and of course we’ve got local industrial noise genius, Insect Deli, lighting the place up as well. That would be enough to make this show worth attending, but Digit216 and Speak Onion are doing a BATTLE SET of breaks, noise, and general clusterfuckery to top it all off. 2 hours of brutality- quick and painful. That’s how we do it. Thanks again to Maruosa and Miyagi for making the long trip to get rowdy with us. And thanks to everyone who came out to check out the insane styles. SO KILLER. Check out some other pics here. Maruosa invades NYC, with I.B.N. artists supporting!! 3/14 at The Charleston. That’s right folks. Get your helmets on, becasue the mighty Maruosa is coming to drop riff after ruined riff on your face and slam beat after cut-up beat down your throat. 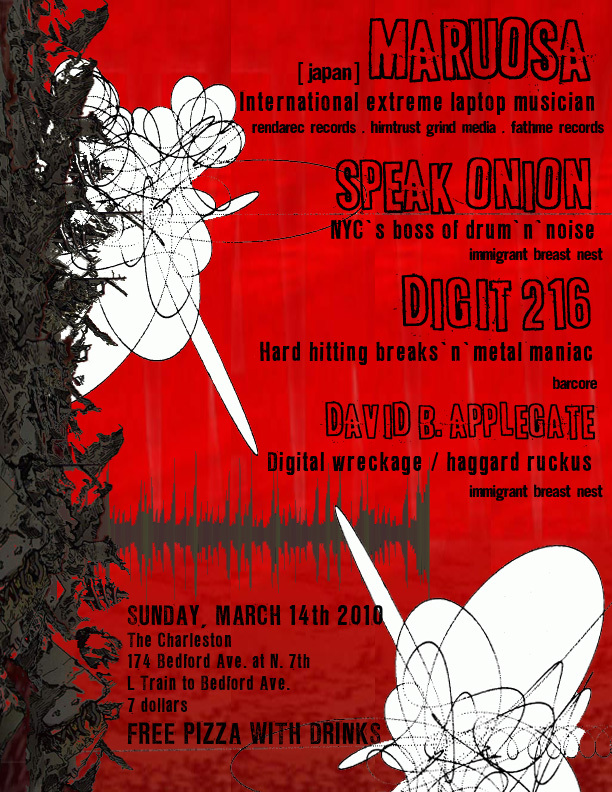 Immigrant Breast Nest is teaming up with Barcore to present this EXCLUSIVE NYC appearance by Japan’s master of extreme laptop shredding at The Charleston on Sunday, March 14. Opening up the night, we’ll have the wrecked digital stylings of our very own David B. Applegate, followed by NYC hard electronics mainstays, Speak Onion and Digit216. It will be a night of screaming bits and bL00r. So head over to The Charleston, grab some free pizza, and blow up with us. We’ll be knocking down buildings all night long. Trust. Oct. 17: Speak Onion @ Barcore w/ Ladyscraper, Ebola, more! Like a shockwave of total devastation, Barcore is back on the Bowery to showcase the most intense and unrivaled producers of sonic dominance! Neodigital disciples smashing, thrashing, and bashing everything under the sun, with enough force of aural impact to level the heavens. From industrialized broken beat mechanics, to jungle mutants, glitch dub deviants and ultragrind maniacs, Barcore has assembled some of the best in innovative deliverance of audio proficiency. Congregate with us on this very special evening, as we embark on a megasonic misanthropic adventure! And you know this is true. Our boy, Speak Onion, hangs with the big dogs in Manhattan, Saturday, October 17, 2009. Start preparing yourself.